How state attorneys general could take down Trump over emoluments. How state attorneys general could take down Trump. 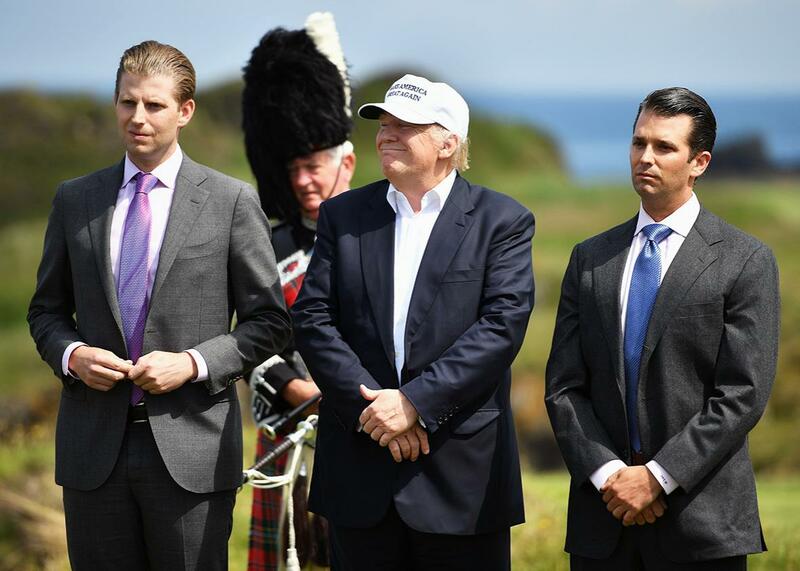 Donald Trump stands with his sons Eric Trump (left) and Donald Trump Jr. after a press conference at his Trump Turnberry Resort on June 24 in Scotland. When last we checked in on President Trump and his assorted emoluments issues, a lawsuit had been filed and there was some question of whether the plaintiffs had any standing to proceed. There is now reason to believe the standing issue will be resolved and that there is a relatively easy way forward. The reason we haven’t seen a ton of Emoluments Clause cases is that prior officials have gone to great lengths to avoid the perception of corruption. Trump, on the other hand, has gone to great not-lengths, and ethics experts largely agree that Trump’s limited efforts to correct for any conflicts—putting his sons in charge of his companies, donating any profits from foreign clients to the U.S. Treasury—are simply insufficient. Last month, a government watchdog group called Citizens for Responsibility and Ethics in Washington and some of the country’s leading ethics and constitutional law experts—among them Harvard’s Laurence Tribe, Fordham’s Zephyr Teachout, and University of California–Irvine’s Erwin Chemerinsky—filed suit arguing that the president is in violation of the Constitution, and more urgently, that CREW has standing to sue. Without standing, or claims of a concrete and imminent injury to plaintiffs, a suit cannot go forward. CREW argues it has legal standing to bring this action because Trump’s Emoluments Clause violations are using up the organization’s time and resources. Many legal analysts have expressed doubt as to whether that claim will suffice to get CREW into a courtroom. But a new theory advanced by Fordham University Law School professor Jed Shugerman may present an end run around that standing problem. Shugerman’s approach uses a whole lot of Latin words, but in a nutshell, he wants to use state laws of incorporation to investigate and revoke Trump’s business charter in New York. In an article last week, Shugerman laid out the theory that corporations are creatures of state law and that attorneys general have the authority to bring actions against corporations that are acting against the public interest. As he put it, “State attorneys general can bring quo warranto proceedings to access information about whether the entities are conduits for illegal emoluments.” By asking state attorneys general in the states Trump businesses are incorporated to sue, the standing problem disappears. As Shugerman puts it: “Instead of private parties suing the public official (Trump), public officials can sue the private parties (the Trump hotels and other business entities). Corporations are a creature of state law, and state attorneys general have a special role in making sure that corporations adhere to federal and state law.” Not only does the standing problem disappear but because standing requirements are lower in state court than in federal court, the state AGs will be more likely to be allowed to proceed. To that end, an advocacy group called Free Speech for People (FSFP) has asked New York Attorney General Eric Schneiderman to investigate whether to revoke the charter of The Trump Organization, Inc., due to the president’s ownership stake in the corporation and its alleged history of illegal activity. The 24-page letter is less interested in new legal arguments, or even in arcane questions of standing, than existing evidence that Trump’s corporate entities are being used to funnel illegal emoluments to Trump. The group’s claims run the gamut from allegations of discriminatory housing practices in the 1970s through last year’s claims against Trump University. In addition to getting around the standing problem, the initiative also sidesteps the need to rope in Congress, the Justice Department, or any other entity disinclined to investigate or question Trump conflicts. Schneiderman has been at the vanguard of state attorneys general who have pushed back on Trump’s actions: He brought one of the cases against Trump University, launched an investigation of the Trump Foundation, and has opposed the president’s executive order on immigration. But Shugerman insists that this legal move could work in many different jurisdictions. Actions under a state’s quo warranto authorities could be brought, for instance, against the Trump Organization in Washington, where it appears to be in violation of the General Services Administration lease that bars any federal official from operating the hotel. And Shugerman adds that in some states, like California, entities beyond the state AG would be authorized to bring such an action. California law also grants this power to local governments and municipalities. Under quo warranto proceedings, the state attorneys general and the courts have flexibility to create a balanced remedy. The first step is discovery to find out about the Trump Organization’s financial arrangements and entanglements with foreign and state entities. The next step is to take the emoluments and fraud claims into court. In the end, the attorneys general and the courts may craft a mix of injunctions, fines, divestment, and/or limited dissolutions of LLCs. It’s important to recognize that the first step of transparency about the Trump Organization is a service to the public interest by itself, but so is the rule of law and anti-corruption. If this action prevents foreign entities from using payments and debts to manipulate American policy, some relatively minor and temporary instability is worthwhile and necessary. It’s become clear that the courts are the best hope for restoring at least some stability to the Presidency Inc. regime in which we now find ourselves and that the states have become powerful agents for accountability. This quo warranto business may feel airy and academic. But the logic behind it is persuasive, and the impacts of this legal theory could be very real.